I order these all the time. A lot of bang for the buck plus. Great on the deck, strolling on the beach, sitting on the ice, and drinking Irish Whiskey with my son-in-law. A Great value cigar that gets really smooth and nutty a 1/4 way in. Nice cheap cigar..it has been my everyday smoke for the last year. Good taste, good construction, have to watch the burn. This had the good flavor and construction of the Oba Oba robustos that I usually smoke but because of the cut, these don't last as long, even with the greater ring size, and because they're more expensive, aren't as good a value. These are above average considering the very reasonable price. They are an every day cigar that doesn't break the bank and offers a good satisfying smoking experience. They are medium bodied with a good flavor. Oba Oba Torpedo 5 Natural by Perdomo 5 x 54—1 Cigar. Pretty good smoke for the price. 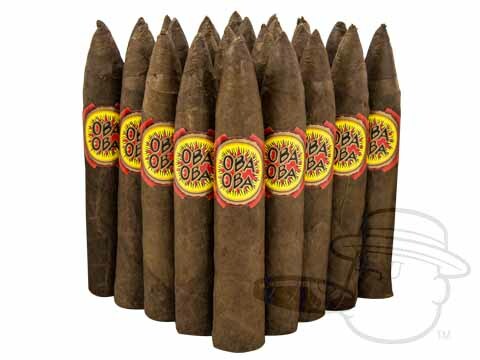 Oba Oba Torpedo 5 Natural - By Perdomo is rated 4 out of 5 based on 9 customer ratings.